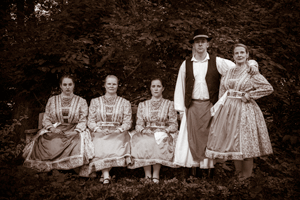 Tisza Ensemble of Washington, D.C. was formed in 1982 by a group of dancers interested in the Hungarian táncház movement. 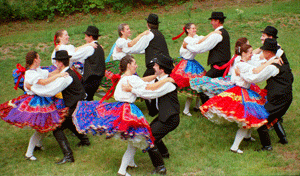 Táncház—literally “dance house”—is a Hungarian folk dance social event. The táncház movement—a modern revival of Hungarian traditional dance and music—began in the early 1970s and forms an active part of the Hungarian national culture, both at home and abroad. Táncház draws on traditions from across the regions of the old Kingdom of Hungary, most notably Transylvania. The term táncház (pronounced tahnts hahz) is derived from a Transylvanian custom of holding dances in private homes. Tisza continues this tradition, holding dances several times a year, as well as regular classes for teenagers and adults interested in learning the vocabulary of steps from each village. 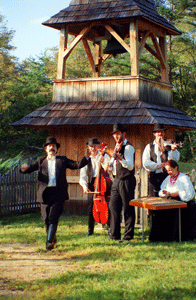 The Tisza Ensemble performing group rehearses weekly, endeavoring to perfect the original, improvised dances. In the couples’ dances, the men lead the dance from a “vocabulary” of figures of a specific village or region. They must react instantaneously to the music, and their women partners have a split-second to interpret and follow the lead. Men’s dances also reach the highest level of virtuosity, each man striving to express his personality, sense of rhythm, and athleticism. Women’s ancient circle dances, accompanied only by their own singing, are another tradition. 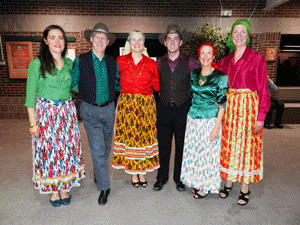 Tisza has performed and taught throughout the East Coast of the United States and Canada, including the Embassy of the Republic of Hungary and the Kennedy Center, the annual Hungarian Christmas Bazaar, and in Hungary. Several of the dancers have studied their art in Hungary and Transylvania. Tisza’s performances focus on improvisation—true to the roots of the dance—rather than on choreography. In addition, many of Tisza’s costumes are vintage pieces from villages.